Which spectral bands to use in remote sensing? Last month, I started building a secret list, in my top secret laboratory, of spectral bands and their spectral signatures. I asked the world’s wisest to contribute their wisdom. One of the best spectral signature cheatsheets that exists today. Today, we explore the visible – and invisible. Whether its near-infrared or the cirrus band, use this clear and concise guide to remote sensing spectral signatures to extract as much data as possible from your imagery. What is a Spectral Band, Anyhow? Thanks to our atmosphere, we only see specific portions of the electromagnetic (EM) spectrum. The graph below shows our “atmospheric window”. The EM energy (in blue) is what we are capable of seeing on Earth. Our eyes can only see the visible portion – red, green and blue. Healthy vegetation (or chlorophyll) reflects more green light compared to other wavelengths. It absorbs more red and blue light. That is why our eyes see it as green. But special types of sensors can pick up other forms of the EM spectrum – invisible to the human eye. For example, vegetation also reflects even more near-infrared (NIR). Near-infrared is invisible to the human eye, but sensors can pick up this spectral band. …So special types of sensors can reveal new insights about Earth’s features, that our eyes can’t. AVHRR NDVI Composite – Image Courtesy of NOAA. …But the USGS has one… and a handy Spectral Characteristics Viewer. And they’ve vigorously tested the spectral reflectance of hundreds of materials in the lab. All this data has been compiled in their spectral library website. Each and every object has its own chemical composition. This is the equivalent to saying that each composition has its own spectral signature. Take the mining industry, there are over 4000 natural minerals on Earth. Each one has its own chemical composition that makes it different from one another. When you have more spectral bands, this gives greater potential to map more minerals, vegetation or anything! You can pick and choose which spectral bands to use in your image classification techniques in remote sensing. This means in your remote sensing classification you will have a higher probability to auto-magically pull out features of interest with spectral signatures. …which brings us to our next section – the spectral signature cheatsheet. A spectral signature plots all the variations of reflected EM radiation as a function of wavelengths. Pick and choose the spectral bands you use in your classification. If you want to pull out vegetation from a multispectral image, this spectral signature clearly shows you should leverage the near-infrared band (0.76-0.9µm). …and Normalized Difference Vegetation Index (NDVI) might be just one of the best ways to normalize your data. Nothing is written in stone for image classification. These are just general guidelines to help you for classification. BATHYMETRY: Because the coastal aerosol band is absorbed less by water, it allows for coastal water and ocean color observation. This is also useful for spectral signatures for marine vegetation like seagrass and other underwater benthic habitat. Snorkel in an oasis of marine vegetation with the deep water imaging of the blue band. Your eyes can see reflected blue light. Depending on the clarity of water, visible light like the blue band can reach depths up to 20-30 meters. 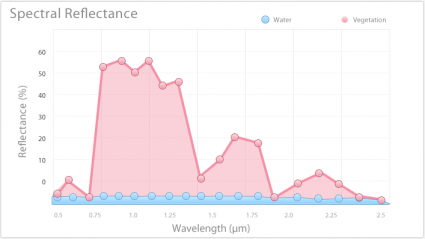 Tweak your spectral signature using the blue band for deep water imaging. DEEP WATER IMAGING: Because of its finer level of spectral penetration in coastal areas, underwater reefs, water turbidity and sediment, submerged aquatic vegetation, turbidity and bathymetric mapping makes for some unique remote sensing applications. SMOKE PLUMES, ATMOSPHERIC HAZE AND CLOUDS: The visible range blue is shorter wavelengths like blue (0.45-0.51µm), which are most sensitive to atmospheric haze. This makes the blue band ideal for detecting smoke plumes because shorter wavelengths more easily scattered by smaller particles. To many, green signifies nature – plants, trees and forest. It’s the same in remote sensing. The green portion covers reflectance peak from leaf surfaces (hence the color green that we see). This also means the spectral reflectance is low in the blue and red regions of the spectrum because of the absorption by chlorophyll during photosynthesis. PLANT VIGOR AND VEGETATION: Green is used to discriminate broad vegetation classes and discriminating plant material. A spectral signature of reflectance peak from leaf surfaces is highlighted in the green band. ALGAL AND CYANOBACTERIAL BLOOMS: Clear water generally reflects little in any part of the spectrum. However, reflectance is maximum at the blue end of the spectrum – hence the color blue our eyes see. But when algal blooms are present, green is where the maximum reflectance generally occurs. URBAN RECREATION: The grassy and forested greens in urban areas are indicated of recreational areas like parks, golf courses and cemeteries. Tropical soils, the built environment and geological features generally have red contribute to its spectral signature. Red is used in formulas like the Normalized Difference Vegetation Index (NDVI) because how much plants absorb red (and blue) light. BUILT AND NATURAL ENVIRONMENT: The red band has been used for discriminating between man-made objects and vegetation. A spectral signature for cultural features such as roads and human settlements are best detected in the red band. CHLOROPHYLL ABSORPTION: One-half of the variables used in NDVI – healthy vegetation reflects more near-infrared (NIR) and green light compared to other wavelengths. It absorbs more red and blue light and is used to quantify vegetation in NDVI. The “yellow” band is relatively new and can be found as early as Worldview-2. This band collects a bit finer detail from the 0.585-0.625 µm portion of the spectrum. Simply, it collects the “yellowness” of a particular object. FEATURE CLASSIFICATION: The yellow band can be useful in different seasons to delineate invasive grass and other general features. It’s also been used to classify individual tree species and crop types by season. The red-edge band is between the near infrared and red band. For chlorophyll, the red portion strongly absorbs light while the near infrared generates a strong reflection. In the transition between these two spectral bands is the red-edge band. CROP MONITORING: Applying the red-edge band to precision farming and even discriminating between healthy and crops impacted by disease. It’s been used to distinguish between crop types and nutrition. Near-infrared reflectance is one of the most powerful ways to classify healthy vegetation. Separating classes like water and vegetation is always easier in the near-infrared region. This is because in the near infrared spectrum, healthy plants reflect it, while near infrared radiation is absorbed more by water. BIOMASS CONTENT: The internal structure of healthy chlorophyll uncannily reflects near-infrared radiation. But when plants wilt and eventually die, the near-infrared response lessens until nothing is left. NORMALIZED DIFFERENCE VEGETATION INDEX (NDVI): Near-infrared is used in spectral signatures for measuring plant health. This can be done using the NDVI ratio, consisting of near-infrared and red bands. NDVI extracts vegetation differences more precisely than if we only looked at visible greenness. There is significant overlap between the near-infrared 2 and near-infrared-1 bands. The main difference being is how much less affected the near-infrared-2 band is affected by atmospheric influence. LAND/WATER BOUNDARIES: Water is a strong absorber of near infrared light, while vegetation is a strong reflector. You can delineate forest fragmentation and quantitatively the loss and gain of forests around the world with near-infrared. Short-wave infrared (SWIR) can help discriminate between dry and wet soils. It’s also used in the spectral signature for geology and soils classification. SWIR is also known for its ability to penetrate thin clouds, and even smoke and haze better than visible bands. MOISTURE CONTENT: SWIR-1 is sensitive to moisture content in soil and vegetation. Reflectance decreases as water content increases. This makes it useful for distinguishing wet earth from dry earth. CLOUD/SMOKE PENETRATION SWIR sees through smoke to the terrain underneath. This helps direct response crews and fight forest fires more effectively. Short-wave infrared-2 has its similarities to SWIR-1. SWIR-2 is primarily used for imaging soil types, geological features and minerals such as copper and sulfates. It’s also sensitive to vegetation and soil moisture variations. Snow and ice feature and clouds appear darker toned. WATER PROPERTIES: Water has much stronger absorption using SWIR. This helps spectral signature responses for monitoring blue-green algae bloom and turbid waters. MINERAL MAPPING: SWIR covers a range where clay types of minerals deliver a greater spectral signature. Hydrous minerals appear darker to discriminate between different types of kaolinite and smecite. Just like black and white film, panchromatic bands collect all visible reflected light at once into a single channel. Because it sees more light at once, the spatial resolution is sharpest in contrast to collecting the red, blue and green channels separately. 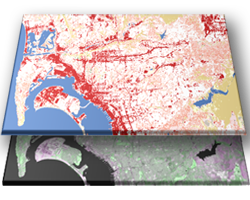 For example, Landsat-8’s panchromatic band is 15-meter grid cells. The other spectral bands are 30-meter resolution with the exception of the thermal band. The only draw-back with the pan-band is that you won’t be able to differentiate colors. PANSHARPENING: Sharpen your images with pansharpening by combining color information with the panchromatic band. Because panchromatic bands sacrifices spectral resolution for spatial resolution, it delivers sharper image definition with pansharpening. The cirrus band earned its name because it’s a specialist of cirrus cloud detection. The atmosphere absorbs almost all of the cirrus band, as the ground is barely visible. High-altitude clouds are detected and picked out which are not visible in other bands. CIRRUS CLOUDS: Cirrus clouds reflect brightly while most land surfaces will appear dark. Improved detection of the pesky cirrus cloud helps with removal and enhancements in imagery basemaps. The thermal infrared band sees heat. Landsat’s thermal infrared uses emitted instead of reflected radiation. It has a coarser resolution of 100 meters but is still useful in understanding surface temperature, night studies and even volcano monitoring. WEATHER PREDICTION: NOAA Geostationary Operational Environmental Satellite (GOES) collects thermal infrared to understand cloud heights and types – and even ocean surface features. Not our Earth, but Chromoscope lets you explore our Galaxy (the Milky Way) and the distant Universe in a range of wavelengths from gamma-rays to the longest radio waves. Planet Labs (or simply Planet) started with one main idea: To capture Earth… Every day. And Planet achieved this by designing an ultra-compact, inexpensive one (CubeSAT) which they could manufacture in bulk.